Reading the today’s IHT articles on data mining, NSA data grabbing and cyber threats reminds me of those lucky days when ‘data’ was plural for datum which in my country, the Netherlands, simply means ‘date’. I was born in 1962 (NSA, please take note) which means that I was well past primary school before personal computers like Apple I (made of wood!) and BBC Acorn became available. Being of a mild geekly disposition and ‘into’ electronics, i.e. transistors, resistors and other components, I read all available magazines and books on how to construct a micro-computer. Not surprisingly, I became an electronics engineer and ended up designing computers myself for a while. At about the same time, Bill Gates and Paul Allen cobbled MS DOS together but it took a while before an “IBM compatible” , as they were called, made it to my desk, complete with dual floppy drive and a whopping 20 MB hard disk. I was one of the lucky ones! Although ’data’ was properly born by then, it was simply a measure of computer performance and personal status: My hard disk is bigger than yours! In 1986, after starting a promising career, it was time to retire and I handed in my career chips and swapped them for a ticket to Australia and this is where this blog post really was supposed to start. Travelling through Indonesia my only technology was a Sony Walkman purchased at Sim Lim Towers in Singapore, supplemented by rip-off tapes of Talk Talk and peers bought for a couple of dollars each at a dodgy shop in Ben Coolen Street. Do you want to know what real information privacy is like? That is what information privacy feels like. But you knew that, right? Except that we didn’t appreciate this. We had no idea that one day a host of international agencies would be scanning our email, phone records, blog posts, facebook holiday snaps: in real time. By the time I post this, some entity will scan this post for suspicious content. It will take less than a second. A millisecond perhaps. Yet, I have an illusion of privacy because these NSA-like entities are anonymous. They keep their conclusions to themselves, providing that I am a regular citizen. As long as my neighbour, friends and colleagues don’t know what I write in my emails etc, I feel safe in my virtual private sphere. But the internet doesn’t forget. Some of my posts on early bulletin boards are still there. And if some are not, I have no illusion that they have been eradicated: they are somewhere out there. The global computer systems don’t forget and every data you provide is assessed in real time. Does this freak me out? No, not in the slightest. I have accepted that my digital self has a global and near-eternal presence. A reasonable chunk of my digital self will live a thousand years and more. Who needs a gravestone in the information age? I have accepted that any amateur sleuth can piece an outline of my life together from this blog post alone and with a bit of googling, that PI could find my front door without too much effort. So what? What does it change for me? When travelling in Asia and Australia I learned that there is something that no photos or letters can convey. The experience of a local smile in Thailand; the scent of a May flower in Vietnam; the cunning cheek of a street urchin in Delhi. I cannot capture this by digital means and therefore it is safe from the spooks. It is safe in the safest place there is: my heart. My heart: my data repository of experience of life. My safe house for dreams, love and sadness. I’m sitting in a little Swiss café, Le Débarquarère in Nyon, by lake Geneva. The NSA can google that and plot another precise coordinate on my trail. They a can trace a circle of 100 kilometres around that and know where I may be within an hour until they pick me up again at my home office posting this blog entry. 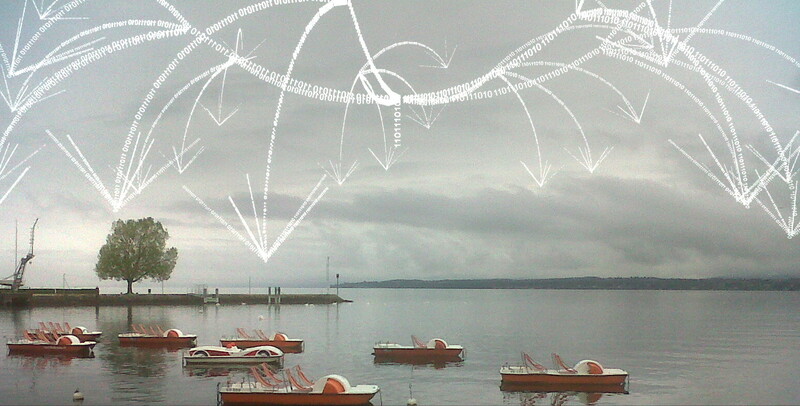 But they won’t see the swans on Lake Geneva. They won’t see the drab wet “pedalos” chained to buoys, awaiting better weather. They won’t see the lush green vines on the “côte” of the lake on my way home. I’d have to blog about the gorgeous chateau’s behind those vineyards for them to ‘see’ them. My digital self is a thin superficial shell that shows the breadcrumbs I drop along the way. The real me is iffy mind-ware in a vast world of experience. Try and eavesdrop on that; I barely make sense of it myself. PS: Please note that by reading this blog post, you are eternally connected to my digital trace and if either of us ever does something irregular, we will both light up in the digital brains that rule this world. Just so that you know. And please behave for my sake. Got a bit emotional there. It’d be nice if all this processing power was directed to something actually useful, like getting our species out into the cosmos where the real adventure is. Processing power is like meat production: the more you have of it, the more it develops.Cows in the pasture have a future as long as we are not all vegetarians and similarly. computers will evolve enormously because we have become information-schizophrenic species: we need computers to check on computers. Fortunately there are a few renegades that use computers to explore what’s really important (like typing a blog!). Good luck with the crime; perhaps we’ll meet in court for the first time! Reading your article made me think that somehow, the world was more innocent during the Cold War. Who’d have thought? Humanity appears to be losing innocence as it ages. I thought we were pretty ‘with it’ as I grew up. Seeing kids today, it appears we were incredibly sheltered. As I wrote this, it occurred to me that we are heading for the Cold War 2.0, a war of threats battled out in the virtual world of global data; exploiting our dependence on data. I think I’m developing some kind of split personality. Sometimes I look at the evolution of technology and I really like where things are going. Sometimes I look at exactly the same data and become horrified about the future. Ideas like what you suggest above make me pretty worried, I guess we’ll have to wait and see. Interesting post! I can relate to anything you say though I never travelled that far away from the tech-equipped world. I like “My digital self is a thin superficial shell” – this is probably how I handle it as well. I am posting only to public newsgroups every since or as if they were public, and I think my online persona is quite self-consistent – I don’t trust so-called closed groups. But I feel that only specific aspects of my ideas or “myself” to to speak lend themselves to online publication. It is not a strategy consciously developed, but my Facebook page – for example – is just the same weird science / spam poetry / geek etc. channel as my blog. I agree to the suggestion by Eric – fill the internet with crap and weird stuff. I am actually most concerned about false negatives – and we don’t need the NSA for that. Cloud service users’ accounts have been suspended because some weird algorithm had considered some of their files violating copyrights. This is so kafkaesque. My hope is vested in society’s ability to overcome stupidity. It might take a little more time though.